Goose the Bear is a seemingly simple mix-up. One day a little gosling hatches out of a lost egg. From the first moment the little creature is absolutely convinced that it is a bear, since the very first thing it sees is the Bear's face. Hidden behind the tale's letters and imaginary forest's trees are some essential questions about coexistence and accepting of others. Is everything that seems different really so different from us? How much of our time and attention we are ready to dedicate to relationships with other people? 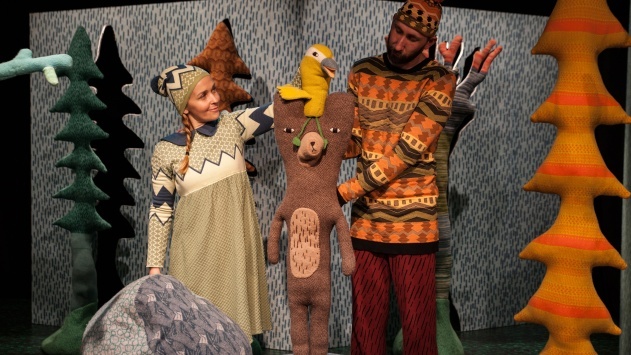 Goose the Bear is a story about tolerance and acceptance of diversity. Medved in mali from Lutkovno gledališče Ljubljana on Vimeo.